Tape Former - Rollformer | Tensor Machinery Ltd.
Rollformers are designed to form corrugated steel tape around a cable core. They provide accurate, low-drag forming of corrugated steel tapes—with less than 5% loss in corrugation depth. 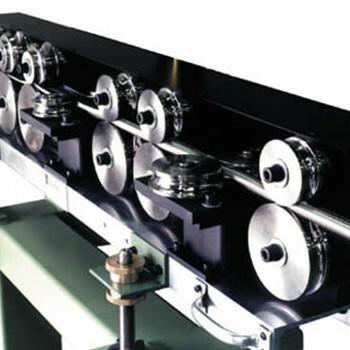 Each machine is designed to accept only one tape width, forming it around one specific core size. Therefore, a separate former is required for each tape width. 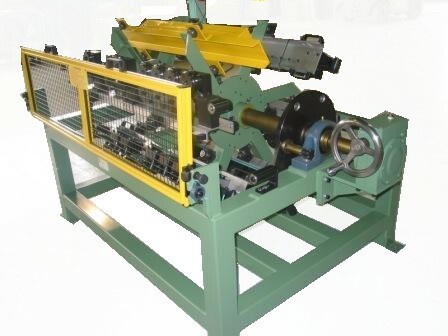 Each rollformer consists of nine forming stations, for a total of 18 profile rollers. There are no dies used and forming is accomplished by rolling-friction. No lubrication of the tape is required. 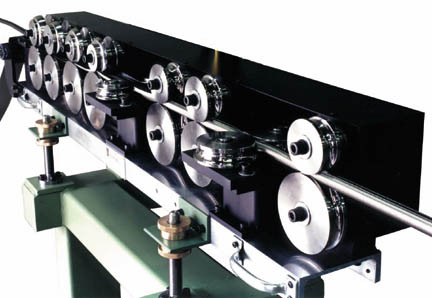 All rollers are ball-bearing mounted; stations are mounted on a common aluminum channel. The rollformers are all factory pre-tested with corrugated tapes, which means no adjustment or set-up time in the cable plant. Since the rollers are hard coated and the tape friction is minimal, a rollformer lasts for years before requiring any maintenance. A ripcord guide is integrated with the rollers to positions the ripcord at the proper 180 degree angle. An optional tube and swellable tape guide are also available as required for some cable designs. To assist in a quick changeover to a new tape size, multiple rollformers can be mounted on a Turret. With a simple turn of a wheel, the Turret rotates the desired rollformer into the line path. Various position turrets (4, 6, 9) are available.